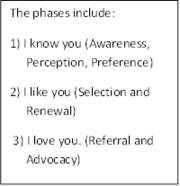 It’s the final two steps of referral and advocacy that define the “I love you” phase. It’s here that word of mouth marketing can truly excel. While it’s true, that influencers and advocates are nouns (person, place, or thing), it’s important to first review the derivative form of the words as verbs (shows action). Influence: To control or move by power, physical or moral; to affect by gentle action; to exert an influence upon; to modify, bias, or sway; to affect; to move; to persuade; to induce. Advocate: To plead in favor of; to defend by argument, before a tribunal or the public; to support, vindicate, or recommend publicly. When consumers select a brands product or service and repeatedly renew their decision to repurchase they demonstrate loyalty and the attributes of a sustained relationship with the brand. That commitment is held at a personal level. They’ve progressed from “knowing” the brand to genuinely “like” it – which is a worthwhile achievement for brand managers and marketers. When the experience between a customer and a brand becomes truly remarkable, it migrates into the phase of I love you. That’s where loyalty on an individual basis begins to multiply with personal referrals and recommendations. The people in this step are influencers for the brand and are inspired to share stories of their appreciation for the brand and the experiences that they’ve enjoyed. Brand marketers who enable the voice of the customer and make feedback easy to share will benefit from influencers exponentially. Of course, unsuspecting brands who deliver disappointing experiences will ultimately interrupt the renewal cycle and leave themselves vulnerable to influence of another type – the kind that certainly isn’t love. Not long ago – less than a decade – customer referrals were the end game for many brand marketers. They’d driven awareness, perception, preference, selection, and renewal with success. Referral was the icing on the cake. But no more. Smart marketers have come to realize that there is another essential step – a step that we can define as defenders of the brand. To borrow a phrase from the US Marine Corp, these are the few, the proud, the brave. 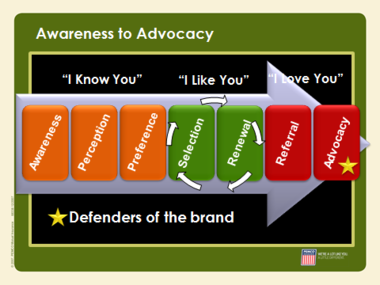 An advocate is the customer who will defend your brand privately and publicly. They’ll defend it without being asked, without compensation and, most importantly, they’ll defend your brand when you aren’t in the room. While small in number, these are the people that must be identified, encourage, and thanked. Marketers can no longer depend on internal resources or P.R. firms to protect the brand from criticism. Those resources just won’t scale for the size of the room we now compete in. The room is the internet and regardless of the listening tools that we deploy, we’ll need our advocates to help us to protect our brands. Do you know the influencers who help to grow your brand? Do you know your advocates who voluntarily defend it? Jan. 13, 2013 I agree with your observation on the path to advocacy. Coaxing consumers down that path requires superior performance on many levels. It is aided a great deal through imaginative campaigns that encourage engagement and add value to the consumer's experience.